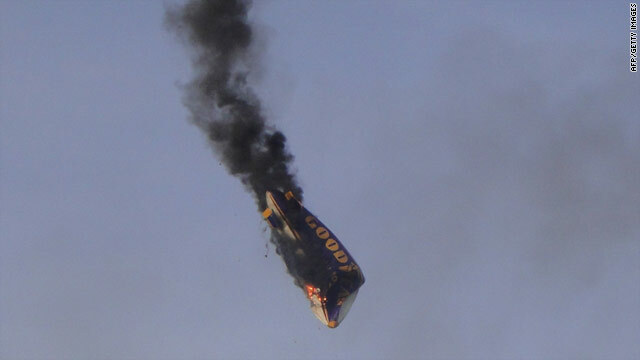 With the loss of ballast from the three passengers, the blimp shot up to 50 meters (165 feet) in the air, caught fire and then crashed. Nerandzic's wife, Lyndy, told Australia's ABC Sydney that her husband sacrificed himself to save his passengers. "When there was trouble on the airship he brought it down to as low as he could to let the passengers jump out and he stayed at the controls," ABC quoted Lyndy Nerandzic as saying. "As soon as they jumped out, of course, being an airship, he knew it would rise up and it did. They found him still at the controls when it crashed. He also steered it away from his ground crew." "When they told me what he had done for the passengers, it didn't surprise me one little bit," she told the Illawarra Mercury. "He was a character. He was larger than life. He was so, so generous." When the crash occurred, the airship was returning from a trip taking the journalists - a photographer from the Bild newspaper and two from the RTL TV network - to get aerial shots of a local festival, Spiegel Online reported. The owners of the blimp, the Lightship Group, said in an "in memoriam" announcement on their website that Nerandzic, 53, was "one of the world's most experience airship pilots," with 18,000 hours of experience piloting airships over 26 years. "Our thoughts at this time go to his wife and family, his colleagues past and present and many friends worldwide," the company's statement said. The Lightship Group describes itself as the world's largest airship operator, with clients including Goodyear, Met Life, General Motors, DirecTV and Sanyo. All of you, quit arguing. A man died saving other peoples lives! People like you make us think that you should be the ones piloting the blimp and going down. No amount of respect can be gained from your foolish arguments. Mike was a great pilot and a good player (especially bar hoping – a big fan of the gals). He was bigger than life – yes he got big. Blimp life on the road and in the air has its good and bad points – I havent yet seen one family or relationship stay together in this industry..You are the exception than the rule to stand by him all these years.. God bless.